The red- and-white-striped needle on an air speed indicator, which indicates the maximum operating speed or VMO. 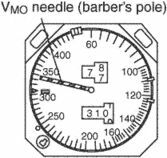 This needle also indicates the maximum operating Mach number above the VMO/MMO changeover level. Compounds called AADs, or aminoacetonitrile derivatives, kill barber's pole worms, even those resistant to current drugs, Kaminsky and an international team of colleagues report in the March 13 Nature. Michael tells me how barbers used to be surgeons a long time ago and that the barber's pole signified the blood and bandages associated with that aspect of the history of the work. Outside there's a graffiti-style mural of a barber's pole and a hard-to-miss afro-and-a-hair-pick-logo. The same image illustrates Abbott's preference for including grounding details at the edges of the frame, in this case a barber's pole. The brown stomach worm (Ostertagia species) also causes illthrift, and anaemia, and death can rapidly follow the blood-sucking activities of the barber's pole worm (Haemonchus contortus). The reception children took part in the Barber's Pole dance, while Year One children danced a Single Plait and a Three in Hand. The door led downstairs to a basement salon and was marked with a spectacular barber's pole in the traditional red-and-white.